This product is featured in: Fausti Italyco tested by Sporting Gun and Fausti Italyco SLX. 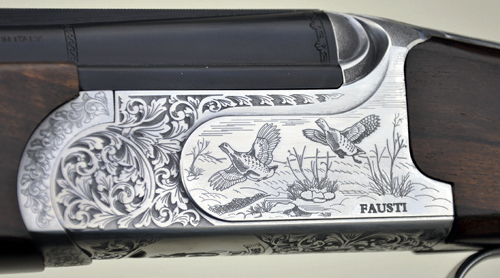 Fausti Windsor 20-bore shotgun review. This month we have a 20-bore over-under gun from a maker which is not that well-known in the UK, but I suspect it is destined to become so. Fausti is based in the Gardone region of northern Italy and is particularly unusual because it?s owned by three girls, the Fausti sisters – Giovanna, Barbara and Elena. They inherited the business from their father and have done much with it since. With a combination of energy and flair and a mixture of high-tech and traditional manufacturing methods, Fausti now make 8,000 guns a year. This includes over-unders and side-by-sides, the former predominating. To put that in perspective the big London names produce less than 100 double guns a year and Beretta something around 40,000-50,000 over-unders. This Windsor game gun is one of a small range now made for the British market and being imported by the Sportsman Gun Centre. First impressions are positive. The Windsor has 28″ barrels and weighs in at 6lbs 8oz, a good weight both for a classic 28″ British 12-bore side-by-side and for a 28″ 20-bore over-under. It has a silver finished (but not too brightly polished) scroll and game scene engraved action. The engraving is laser etched by a new process and looks quite smart. Poor rolled-on game scenes spoil some guns. That?s not the case here. The only thing that does not appeal to me, a very small point, is the pierced top lever, which seems to gild the lily a bit (the plain steel trigger gets a thumbs up though). As for the rest, for the price, it all seems very impressive. Metal to metal and wood to metal finish are competent. The wood has decent figure and form. I like, in particular, the fairly open radiused grip and the rounded fore-end. The barrels of the Windsor, like most modern mass made over-unders, are monobloc where two tubes are braised into a block which hinges on the action and carries the lumps (which are bifurcated in this case). The proof marks are for 3″ (70mm) cartridges, and there are interchangeable chokes which are standard steel shot friendly. The internal and external finish of the barrels is generally good, although the straightness is not quite perfect. I have seen much worse in guns 30 times the price. The bores are chromed, which makes sense in an interchangeable choked gun. The joining of the tubes to the monobloc is better than average and the jointing of the barrels to the action is sound. The gun has a ventilated, narrow, sighting rib, and vented joining ribs. The former is neatly machined and equipped with a red translucent rod sight. Although this is not too big and, therefore, not especially distracting my preference would be a traditional brass bead on a field gun because it is less prone to damage. The 6mm sighting rib is well suited to the gun and helps to keep the barrel weight down. There is an argument for a solid rib on a game gun because it is less easily dented, but the weight advantage of the vented form is also a consideration. The action of the Fausti is not quite the Gardone norm. It has the popular combination of stud pin hinging and a Browning style bolting system seen on half a dozen other makes. Coil springs are used to power the hammers too, and the single trigger mechanism is of the recoil-activated type. A selector is combined with a top strap safety. The interesting thing about the Fausti, though, is that, unlike most Gardone guns, it has an extra locking system. Inspired by the Boss, there are projections on the inner action walls, which meet with corresponding slots in the sides of the monobloc, these are simpler than the draws and wedges of the Boss, but ingenious nevertheless. The stock on the Windsor is made from good quality wood, which has been well finished. The length of pull with a 3/8″ pad is a useful 14.7/8″ with an extra 1/8″ at heel and ¼” at toe. The drop is 2¼” at heel and 1½” at comb. Fine, but a little low for standard measurement. My preference would be to raise the heel 1/8″. The shape of the stock comb, which is nicely tapered but not too thin, and the full, but slim, grip both pass muster well. They contribute to the gun?s elegant look and better than average handling qualities. The rounded fore-end is especially good and ideally suited to this sort of gun, both aesthetically and ergonomically. Unlike the Schnabel fore-end the front hand position is unrestricted. I am a great fan of 20 and 28-bore over-unders for game shooting. My particular preference is for 30 and 32″ barrels, but this little 28″ Fausti (which is also available in excellent 30″ form) shoots very well. Its weight makes it effortless to use. Everything works well and I like the larger than average barrel selector, which is useful when hands are cold or wet. The trigger, which has a well-shaped plain steel blade, feels comfortable and the pulls are pretty good. The ejectors are well timed and reasonably powerful. Felt recoil is quite acceptable even with 28gram loads. I like the way the Windsor handles. It is quick but not wild and would be ideal for walking up, partridges or, indeed, for use in a pigeon hide. It also offers excellent value for money. One of the reasons that machine made 20-bore over-unders have become so popular in recent years is because they share similar, lively-but-pointable, handling characteristics to classic British 12-bore game guns at a much reduced cost.